AVG Protection Free is a lightweight antivirus and antimalware application you can use to protect all your computers and devices, as well as easily keep track of their security status from a unified dashboard. AVG Protection Free is actually a software suit that contains AVG Zen and AVG Antivirus Free. 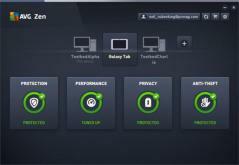 AVG Zen provides the management dashboard which you can use as soon as you log into the Zen network. Then, you will be able to see all the devices associated with your AVG account, regardless of their platform. In other words, you can use AVG Protection Free as an antivirus on your Mac, or Windows computer, as well as Android smartphone or tablet. The dashboard allows you to quickly add nee devices, but also to run remote scans on the selected device(s). For any newly connected computer or mobile device, the application’s modules are automatically installed after launch. Thanks to AVG Antivirus Free, your device receives real-time protection against a multitude of threats such as viruses, malware, Trojans, spyware, rootkits and others. What’s more, AVG Protection Free also safeguards your privacy, web browsing and email thanks to its dedicated set f tools. Any online link you are trying to access will be automatically scanned to ensure you are not taken to a malicious website.